The following article is translated from L’internazionalista No. 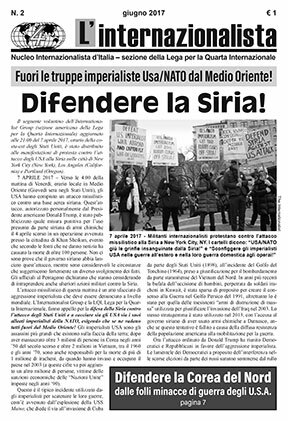 2 (June 2017), published by the Nucleo Internazionalista d’Italia, section of the League for the Fourth International. Second issue of L’internazionalista. To order a copy, send an e-mail to it_internazionalista@yahoo.com. There has been a rise in racist frenzy and nationalist chauvinism in Europe with the refugee “crisis,” the anti-immigrant inspired campaign for British exit from the European Union (“Brexit”) and various far right and fascist forces like Matteo Salvini in Italy and Marie Le Pen in France calling for their countries to pull out of the EU and drop the euro in order to better defend Christian culture and deport all “illegals.” The Lega Trotskista d’Italia (LTd’I, Italian section of the International Communist League, ICL) has been tailing behind this chauvinist wave, the latest gambit being their recent call for the Italian bourgeoisie to pull out of the EU and return to the lira. The German Spartacists proclaimed in World War I that “the main enemy is at home.” For the ICL today, like the reactionary nationalist populists, the main enemy is in Brussels. The reaction of the LTd’I to the refugee crisis, when thousands of refugees were dying trying to enter into Europe, was to polemicize against “open borders.” The Ltd’I refused to call for the right of anybody to have refugee status in Europe who was not already there. Their paper Spartaco (April 2016) polemicized against the right of immigrants and refugees to move around freely in Europe (see article “The Refugee Crisis and Imperialist Barbarism” in The Internationalist No. 44, Summer 2016). This anti-immigrant position is especially reactionary since EU citizens have the right to do so. The LTd’I refused then and still refuses today to oppose the Dublin III fast-track deportation decree. Then the ICL screamed victory with the success of the chauvinist Brexit campaign last June, calling it “a stunning defeat for the city of London, for the bosses and bankers of Europe as a whole as well as for Wall Street and the U.S. imperialist government” (Workers Hammer, Summer 2016). They fail to mention the dramatic increase in the number of racist attacks during and after the chauvinist Brexit campaign. The campaign was marked by the murder of Labour MP Jo Cox in Yorkshire on June 16. Her killer reportedly shouted “British first” and was in contact with fascist circles both in the U.K. and U.S. for years. They do not explain how imposing further restrictions on Polish workers entering Britain (the main selling point for Brexit) and endangering the status of many workers already there furthers the interests of the working class. The same leaflet quotes and attacks (from the right) a statement of the PCL (Partito Comunista dei Lavoratori, Workers Communist Party) which reads: “The truth is that the alternative is not between the euro or lira, between free trade and protectionism, between the European Union and nations. The real alternative is between capitalists and workers, between capitalism and socialism. In every country and on a worldwide scale” (“Euro or Lira, the Real Problem Is Capitalism,” www.pcllavoratori.it, 4 February). The statement is true enough, although the PCL is constantly pursuing class-collaborationist popular-front and parliamentary-reformist policies rather than revolutionary struggle against capitalism. But the LTd’I is denouncing the PCL from an Italian nationalist point of view, pushing for an independent imperialist Italy in the context of capitalism. The LTd’I goes on to polemicize against the Nucleo Internazionalista d’Italia, claiming that we “give a Marxist veneer to the arguments of the bourgeoisie against the exit of Greece and Great Britain from the EU.” In reality, we called to abstain in the June 2016 referendum, counterposing to the competing bourgeois chauvinist campaigns to “Stay” or “Leave” a class fight for asylum for refugees and citizenship rights for all immigrants. We opposed the bourgeois nationalist call for “Grexit,” while noting that the Greek bourgeoisie might be forced to leave the EU and the euro out of desperation. But the LTd’I bombastically declares that we “are heading towards the Fourth Reich of German imperialism” because we didn’t tag along with the bulk of the Greek left (and the ICL) in obeying bourgeois populist premier Alexis Tsipras’ call to vote “no” in his phony July 2015 referendum. Instead, we told the masses the bitter truth, that Tsipras had already organized a sellout to the Eurobankers and that following his vote call would only give cover to that. Instead, we put forward a program of class struggle against this farce. In fact, the “no” vote won, and as we had warned, Tsipras promptly made an even worse deal with the Brussels bankers. While the ICL loudly insists that it is an absolute principle to call for withdrawal of imperialist countries like Britain and Italy from imperialist alliances at all times, joining in this with bourgeois nationalists and fascists, it no longer demands the independence of Puerto Rico from U.S. colonial rule and independence for the French colonies of Guadalupe and Martinique. So they accept the presence of French and U.S. imperialism in these colonies. Lenin called groups like the ICL “social-imperialist,” socialist in name and pro-imperialist in deeds. These fake-Trotskyists would have been barred from joining the Communist International in 1920 because they violate point 8 of the famous 21 conditions necessary for adhesion. Their acceptance of colonialism is in line with the ICL’s loud support for the U.S. imperialist military occupation of Haiti in 2010. The ICL’s British paper Workers Hammer (Spring 2017) claimed that there was a “clear class difference” between voting to “leave” or “stay” in the EU. There is no “clear class difference” or “class line” in the Brexit and Italexit campaigns, as both sides of this debate are reactionary and bourgeois. But we note that with its position the ICL places itself on the same side of the class line as various far right racist forces such as Matteo Salvini of the Northern League and Nigel Farage of the UKIP, as well as Marine Le Pen of the fascist National Front in France. From Puerto Rico and Haiti to Europe, and elsewhere (such as Mexico, where the ICL can’t tell the difference between death squads and a workers union), the latter-day ICL repeatedly fails to see the real class line dividing the exploited and oppressed from the bourgeois exploiters and oppressors. Now during Trump’s bonapartist mobilization to round up and deport immigrants and ban refugees, the SL refuses to call for asylum for refugees (or even just to let them in) and attacks the Internationalist Group (the U.S. section of our LFI) for calling to “defend sanctuary cities.” These 400 jurisdictions have been targeted by the Trump administration for not cooperating with federal requests to keep undocumented immigrants arrested on minor charges in jail as a “courtesy” to the I.C.E. immigration police (which courts have ruled unconstitutional), and for telling local government employees not to inquire about or pass on information about individuals’ immigration status. This minimal prohibition (often ignored by the cops) can mean a lot for undocumented workers. But while Trump is moving to slash billions of dollars from education and social service funds to “sanctuary cities” to punish them, the SL tells workers to do nothing against this threat.